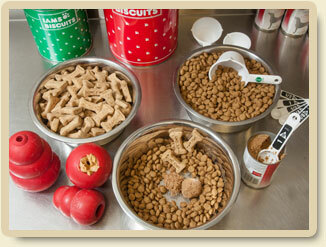 All of our canine guests are fed premium veterinarian recommended dog food during their stay. The specific blend has been chosen for its high palatability and digestibility making it the perfect match for dogs in a boarding situation. Both dry and canned formulas are available. You are welcome to provide your pet’s regular food if you choose (please pre-pack individual bags). Arrangements can be made if your pet is on a specific feeding schedule or has special requirements (a small service charge may apply). It is recommended you limit the amount of food you provide your pet on the day of check in due to the natural excitement your pet may experience upon arrival at the Inn. Likewise, food and water should be limited for the first hour or two after you pet arrives home. This will allow your pet ample time to settle in before feeding. Happy Hour – Each afternoon at approximately 5 o’clock all of our guests will participate in Happy Hour. Each guest will be treated to a mouthwatering, delectable “Happy Hour” treat to help them wind down from a busy day spent benefiting from all that Morris Animal Inn has to offer. Please let us know of any dietary restrictions during check-in.